After evacuating last Friday, some of the National Weather Service employees are back, working to return to normal operations. With the failure of a levee on the Union Dike last Friday morning, the National Weather Service staff had about an hour and a half to get out of their building. "And there was water with ice coming our direction as we went west, so we could see, kind of, the wave coming toward us," says NWS Valley Meteorologist in Charge Suzanne Fortin. In critical moments, they moved quickly, thanks to their training and annual practicing of their Continuation of Operations plan. "We do exercises with practicing the COO so that we would know what to do, where to meet, and what to bring, and so forth," explains NWS Valley Meteorologist Brian Smith. As they left, they powered down the radar and NOAA weather radio service. 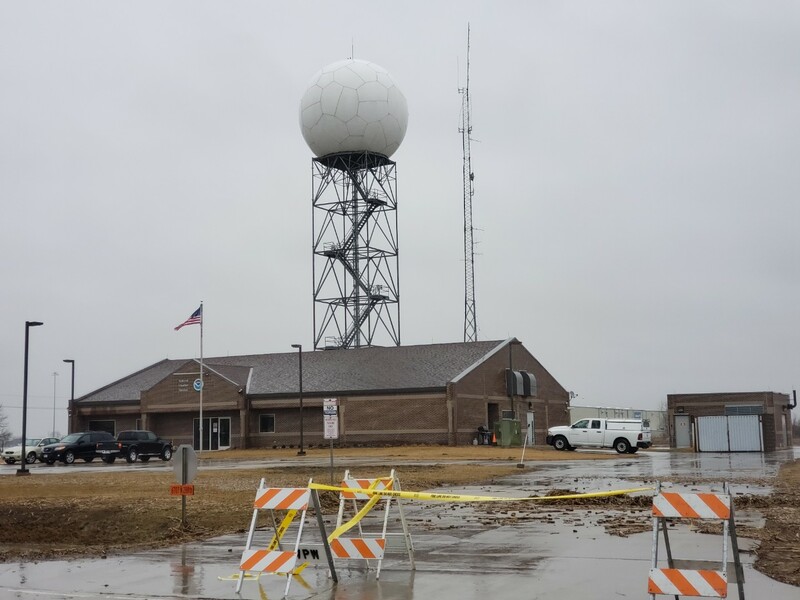 Workers were scattered between the NWS office in Hastings, the state emergency management agency office in Lincoln, and an office in Omaha at the Papio-Missouri NRD building to keep providing forecasts, warnings, and general information to the public. When the evacuation orders were given last Friday, employees at the National Weather Service in Valley weren't sure what they'd find when the returned to the office. Finally, a few were able to return to the building on Tuesday. Much to their relief and amazement, the office was dry and hadn't sustained any damage from what they could tell. "Nothing super apparent, just the road damage, you know, the erosion. We just weren't sure of the stability of the ground underneath our feet," adds Fortin. Fortin and smith credit the ground's frost depth of just over a foot for not allowing too much water to seep into the ground and cause more damage, along with a bit of protection provided by the Valmont plant to their north. "Their dual levee system, their retaining ponds, they took the brunt. Most of the water came from the south and east and swirled around the back of our property there by the upper air shelter," says Fortin. Much of their time now is spent putting systems back online and conference calling to work out details as they move forward. Testing and inspection will continue, and once they are given the all clear, the office can return to normal operations, hopefully by the end of the week.